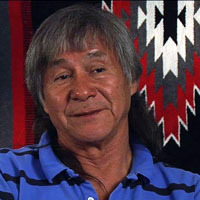 Sam Windy Boy is an enrolled member of the Rocky Boy’s Chippewa Cree Tribe. He has been involved in Indian education for nearly 30 years. Respecting Belief Systems - Sam Windy Boy Jr.
Executive Order Reservation - Sam Windy Boy Jr.
Rocky Boy's Chippewa & Cree Tribal History Project Sam Windy Boy Jr.